I have been a certified strength and conditioning specialist for many years now and one of the most common topics I’m asked about is how to strengthen your body. There are a lot of factors which must be considered when answering this question, but I am going to try and provide you with five tips to strengthen your body. Nothing else will give you the kinds of effects upon your bones, joints, physiology, and muscles like weight training. Placing the bones, joints, and muscles under stress causes them to adapt. For instance, weight training will increase the production of new bone, cartilage, ligaments, and tendons. It will also cause your muscle cells to become larger and more numerous. This will make simple tasks involving movement, weight-bearing, balancing, and lifting a lot easier. Weight training will also make your heart stronger, lower your blood pressure and blood sugar, and will improve the way your body burns and stores fuel as body fat. 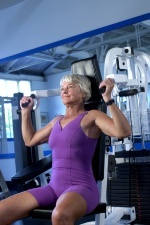 Weight-training can also improve insulin sensitivity and the feelings of mental and physical well-being. My advice is to start. If you’re new to weight training, ask a specialist at the gym which type of equipment is right for you. I recommend using machines in a circuit pattern where you perform one set of 15-20 repetitions for each separate body part without rest. If you don’t want to go to the gym, you can do the same things using a set of weights or elastic bands. I prefer that you use dumbbells of various weight increments. Train with weights three times per week for 20-30 minutes to start. Remember to stretch before, during, and after each session. You also must progressively increase the intensity of your routine if you want your body to adapt effectively to it. If you want to enjoy the full effects of exercise on strengthening your body, you must also work on your heart and lungs. Performing some type of cardiovascular exercise for 20-30 minutes daily will strengthen your heart over time. You can also use this guideline: subtract your age from 220 and that’s what the general maximum heart rate for your age is. The key point here is to increase your pulse to a rate which is approximately 50% to 60% of this maximum heart rate and keep it there for at least 20 minutes. By doing this your heart will beat harder but less frequently while pumping the same amount of blood. To assess your progress, check your resting heart rate at regular intervals. When your cardiovascular system strengthens, your resting heart rate will lower and will return to normal quicker following exertion. Your lungs and red blood cells will also become much more efficient at carrying oxygen so the shortness of breath you used to experience when climbing stairs is no longer as obvious. Brisk walking, cycling, swimming, cross training machines, and jogging are all great methods of improving your cardiovascular fitness. PLUS: Are statins to blame for weakening muscles? Core training using a Swiss or Bosu ball can help you strengthen the muscles that provide mechanical support for your spine. It can also help you improve your flexibility, posture, balance, and muscular strength by targeting the specific muscles which help support you against the forces of gravity. If you want to strengthen your body like this, I recommend taking a class or meeting with an instructor to start. If you get enough sleep, you can recover from your workouts, as this recovery period is the most important part of the process. When you recover from exercise during sleep, your body will repair itself and adapt to the new stresses you have added to it. You should be getting at least eight to nine hours of sleep per evening to properly recover from exercise. The more you exercise, the more you need energy, nutrients, and fluids. Your body will require an increased supply of available nutrients during the exercise session to maintain the degree of intensity and duration of effort necessary for adaptation. Your body also requires additional nutrients to deal with the stress that exercise can have on your immune, nervous, and endocrine systems, which all undergo a significant degree of adaptation resulting from exercise. Good quality food like lean proteins, complex carbohydrates, vegetables, lower-fat dairy products, eggs, seafood, fruit, and healthy fats will fuel your body properly. I also recommend the consumption of at least two liters of fresh water per day if you are exercising regularly. Coombes, J.S., et al., “Exercise Is Medicine: Curbing the Burden of Chronic Disease and Physical Inactivity,” Asia Pac J Public Health; published online April 9, 2013. Hamar, B., et al., “Impact of a Senior Fitness Program on Measures of Physical and Emotional Health and Functioning,” Popul Health Manag; published online April 5, 2013. Jakicic, J.M., et al., “Four-Year Change in Cardiorespiratory Fitness and Influence on Glycemic Control in Adults With Type 2 Diabetes in a Randomized Trial: The Look AHEAD Trial,” Diabetes Care; published online December 6, 2012. Micheo, W., et al., “Basic principles regarding strength, flexibility, and stability exercises,” PM R. November 2012; 4(11): 805-11. Imayama, I., et al., “Exercise Adherence, Cardiopulmonary Fitness and Anthropometric Changes Improve Exercise Self-Efficacy and Health-Related Quality of Life,” J Phys Act Health; published online October 4, 2012.